Was there a medieval zombie invasion, surely not. You would be forgiven for thinking that fear of the undead was a modern incarnation, but no, it seems that the threat of a zombie invasion was dreaded just as much as it is today in Medieval times too. Sure they didn't have George A. Romero movies or The Walking Dead back then, but that doesn't mean they weren't scared of the dead rising from their graves and doing unspeakable things. Because new analysis of bones points to evidence that people in North Yorkshire, England were wary about the threat of a medieval zombie invasion rampaging through their village. The bones, around 137 and dating to the 11th to 14th centuries, were excavated from a pit in a long-abandoned settlement called Wharram Percy. The state of the bones—including knife marks, cut bones, scorching—showed that they had been burnt and mutilated. Historians and archaeologists had long wondered why, suggestions included starving villagers turning to cannibalism or the dead people being outsiders. These ideas have been recently discounted by experts however. And now scientists believe that they appear to be the first good archaeological evidence showing practices undertaken to stop the undead rising from their graves and killing the living, bringing to light the crossover between zombie fact and zombie fiction. Basically they were trying to stop a zombie invasion. Medieval Zombie invasion scene from 'The Decameron of the Dead'. Various folklore from Medieval times spoke of the dead rising to roam around their local area spreading disease and committing acts of violence. Other tales from the Middle Ages spoke about the devil or demons inhabiting and reanimating corpses to attack the living. This ties in with the Medieval idea that the undead were the result of lingering malevolent life-force in individuals who had committed evil deeds or caused animosity when they were alive. Medieval writings also spoke about how you can deal with the undead, using burning and decapitation. The new findings, published in the Journal of Archaeological Science Reports, says the condition of the bones would tie in with this. And the experts also say that analysis of the teeth showed the bodies were buried near to where they lived, meaning they weren't outsiders. 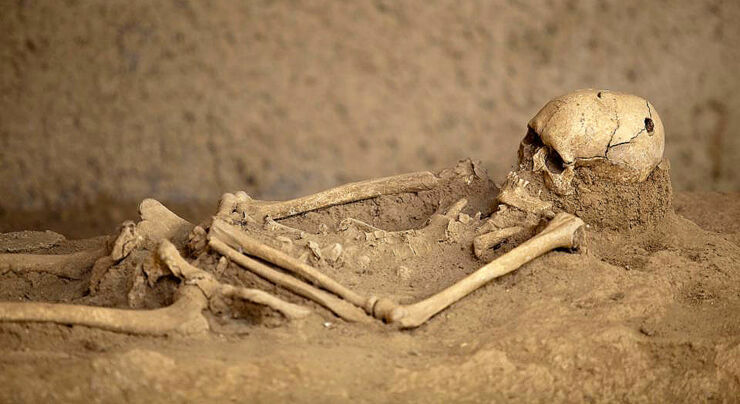 "This was surprising to us as we first wondered if the unusual treatment of the bodies might relate to their being from further afield rather than local,” says Alistair Pike, professor of archaeological sciences at the University of Southampton." it certaily does seem to tie into the folklore around a medieval zombie invasion from that period. 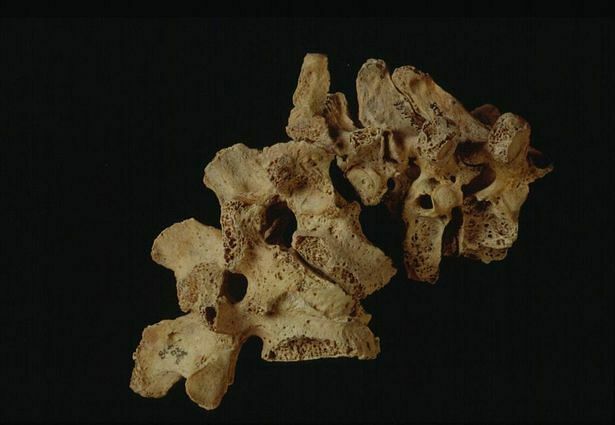 Bones found from Wharram Percy dig with many of them appearing to have been burned and mutilated. And it was also ruled out that they were the victims of cannibals, starving villagers who might resort to desperate measures due to the many Medieval famines. Because the knife marks on the bones indicated otherwise. In cannabislism these marks cluster around major muscle attachments or large joints, at Wharram Percy they were based around the head and neck area, according to researchers. “The idea that the Wharram Percy bones are the remains of corpses burnt and dismembered to stop them walking from their graves seems to fit the evidence best,” says Simon Mays, human skeletal biologist at Historic England. “If we are right, then this is the first good archaeological evidence we have for this practice. It shows us a dark side of medieval beliefs and provides a graphic reminder of how different the medieval view of the world was from our own.” Imagine it, without the internet, Netflix and smartphones it must have been a terrible place. Medieval zombie invasion. 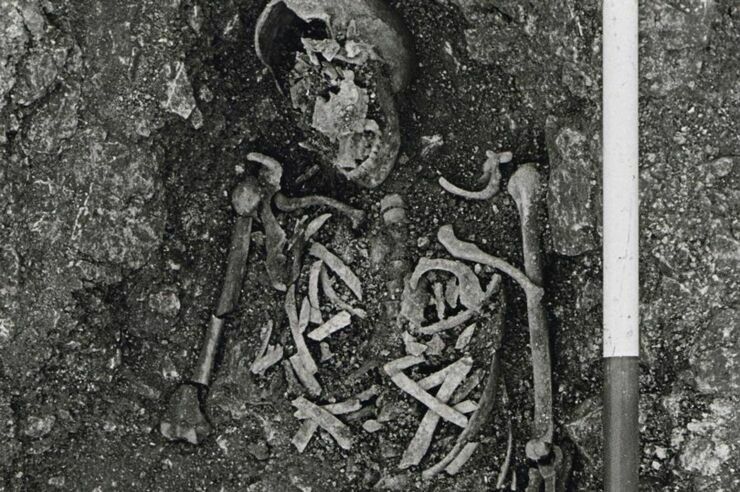 Remains of a woman and fetus discovered from an excavation at Wharram Percy. Medieval Zombie invasion. Human remains found at Wharram Percy. 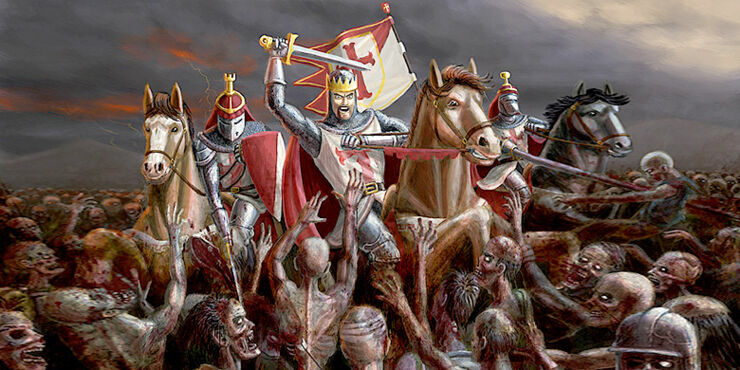 Medieval zombie invasion. 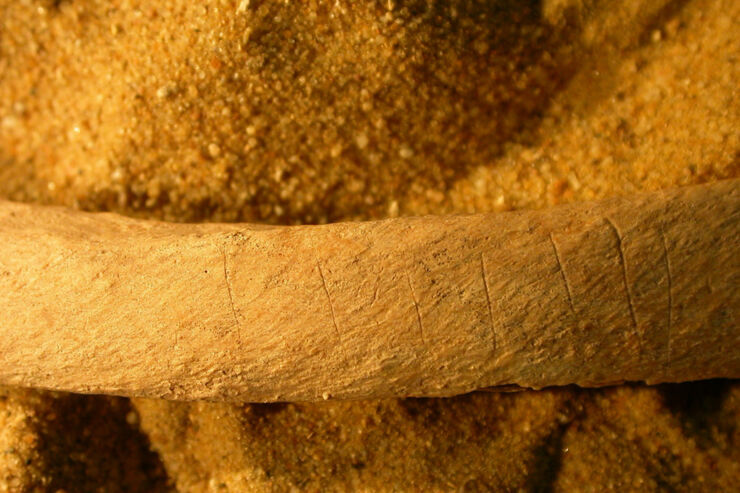 Knife marks on a human rib bone. 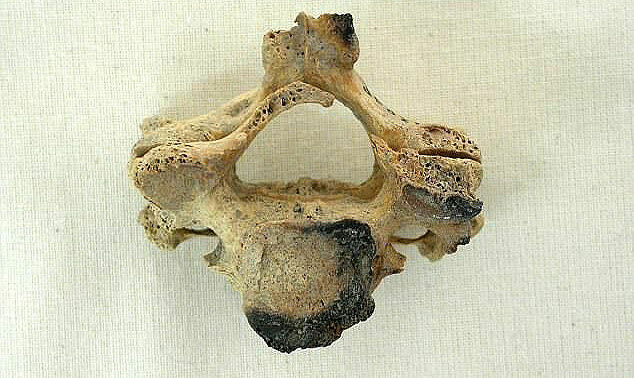 Medieval Zombie Invasion: Section of vertebra shows fire damage after the victim's head was chopped off. 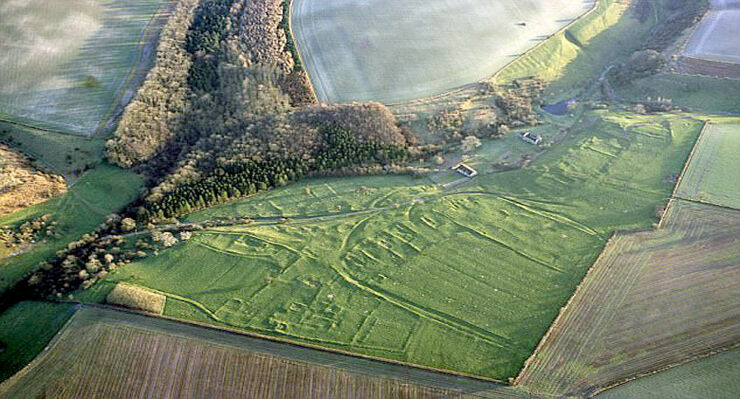 Archaeological excavation area at the abandoned village of Wharram Percy. 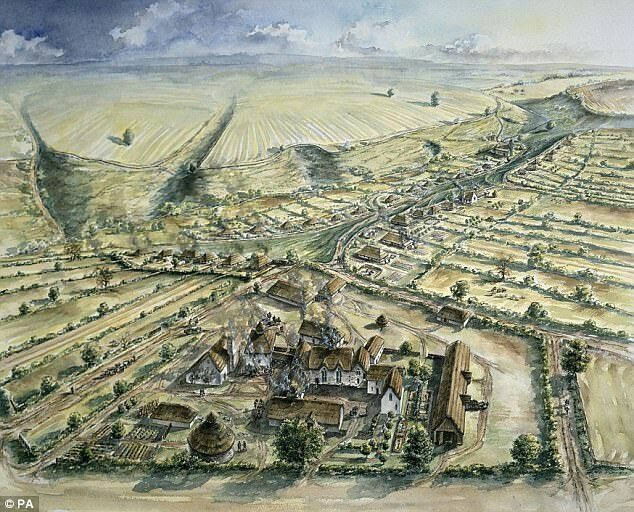 Artist's impression of the village of Wharram Percy in medieval times.